— Avatar Meher Baba, "Song of the New Life"
Baba’s Tree is a fallen giant, ravaged and possibly destroyed by raging fires and mighty winds. The Thomas Fire shattered the tree’s crown and much of the trunk on December 4, 2017. AN AERIAL VIEW of Baba's Tree a month after the Thomas Fire struck Meher Mount on December 4, 2017. The fire shattered the tree's crown and much of the trunk. (Photo: Russell Latimer, Eye of Mine Action Cameras, January 4, 2018). The Avatar of the Age claimed this tree as His own when He sat upon the dry leaves under its leafy canopy. Agnes Baron, caretaker of Meher Mount from its founding in 1946 until her death in 1994, ushered Him there when He came on August 2, 1956. Meher Baba alone sat, gesturing that no one else should do so. Agni, a nickname given to Agnes by Meher Baba and meaning "Fire" in Sanskrit, designated this tree as Baba’s Tree when she first visited Meher Mount in 1946. Agni connotes the Vedic fire god of Hinduism. Since then, pilgrims have come from around the world to walk where He walked in the wilderness garden that is Meher Mount, and to sit with Him awhile under His Tree. Many have also come who know nothing of Meher Baba, yet are drawn to His mountain and to His Tree. They often report moving experiences which are special and unique for each person. Fire has been a visitor to Baba’s Tree and to Meher Mount more than once. On October 14, 1985, fire ravaged and destroyed nearly all Meher Mount, including all the buildings and the 1950 Ford woody station wagon in which Agnes drove Meher Baba to Meher Mount and back to the Roosevelt Hotel in Los Angeles in 1956. The Guest House, in which Meher Baba sat to greet visitors most of the day, was burned. The stone fireplace and chimney of that house is the only remaining man-made structure on Meher Mount, as Baba’s Tree is the only remaining natural landmark. 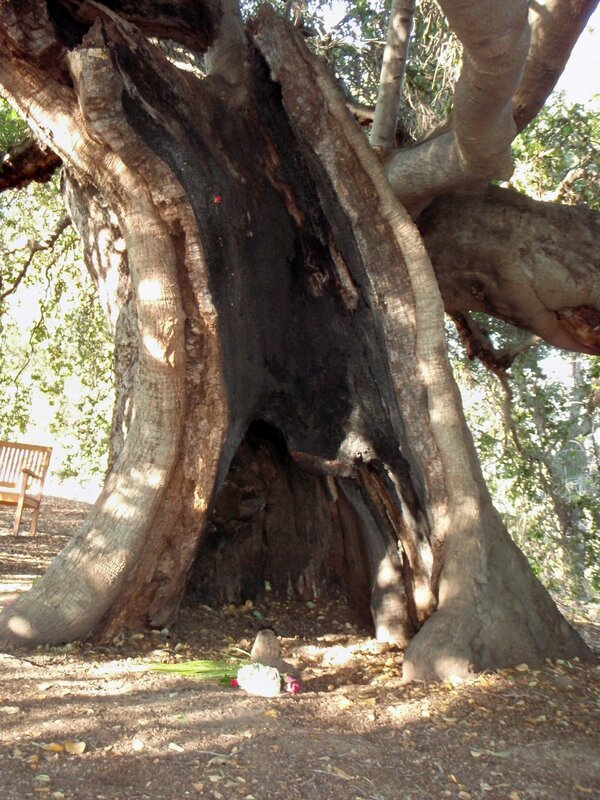 Baba’s Tree had been a honey tree, home to bees who found a way in and hollowed out a cavity inside the trunk. So, when the raging fire whipped along the Sulphur Mountain ridge in 1985, it found a weakness in the trunk. Coast Live Oaks (Quercus agrifolia) are normally relatively fire resistant. But this weakness – a result of having given a sweet home to the bees – allowed the fire to enter and burn the center of the great trunk. The 1985 fire also torched a major limb that ran parallel to the ground about eight feet above where Meher Baba sat. Embers on the tree were still smoldering and smoking from October 14, the start of the fire; to the anniversary of Meher Baba's New Life on October 16; and until October 19, when firemen brought hoses and finally extinguished the fire in the tree. Thus, it is called the New Life Fire by Meher Mount. A month after the New Life Fire, Baba’s Tree looked dead. It was black, leafless, and terribly scarred. The main trunk was hollowed out and black inside. Limbs over 30 feet in the air had burned. The great limb above Meher Baba’s seat had burned nearly through by the trunk with its furthermost branches fallen to the earth. After a few months, green leaves emerged from buds on the limbs as Baba’s Tree began to express its New Life. Despite the blackened cave in Baba’s Tree trunk and its many burned limbs, the huge canopy gradually regained its leafy beauty. Many of the limbs, though burned and dead on the bottom where the flames and heat surged up through the height of the tree, gradually showed live wood growing over the edges of the dead undersides. 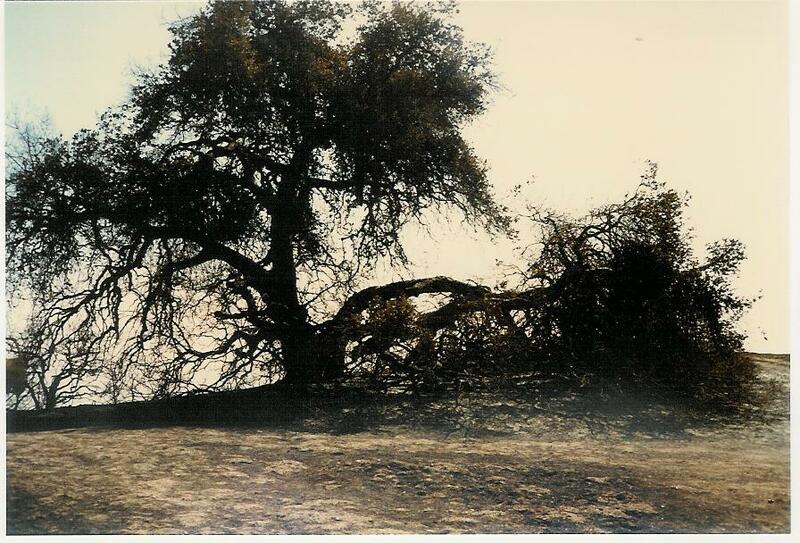 Traumatized and covered with scars and one large jagged limb break, Baba’s Tree survived the 1985 fire to continue its role as a major focal point of Meher Mount. Situated on the promontory named Avatar’s Point, overlooking the plains and mountains and the Pacific Ocean, it continued to stand majestically while giving shelter and nourishment to many other species. The people who came were touched not only by its strength and beauty, but also by its flame-forged character and vulnerability, and of course by Meher Baba’s eternal presence. Now, in early 2018, it is not clear that Baba’s Tree will survive this latest devastating fire and the high winds that accompanied it. Shattered and broken, the largest parts of the tree lie on the meadow, partially burned. The already hollow trunk has been ripped apart except for a few shards that still support some large limbs, including the large limb that arches over Baba’s seat. That limb burned again, and its support from the remains of the trunk is precarious, though there are some green leaves on its branches. Several other major surviving limbs are also at risk of breaking, and this could endanger the remainder of the trunk, which could be catastrophic. The precarious state of the tree is dangerous not only to the tree itself, but also to people walking under its limbs and remaining canopy. Plans are under development with highly qualified arborists for protection of the tree as well as people, by sequestering the tree in “seclusion” while addressing the risks and taking serious measures to try to assure Baba's Tree survival. 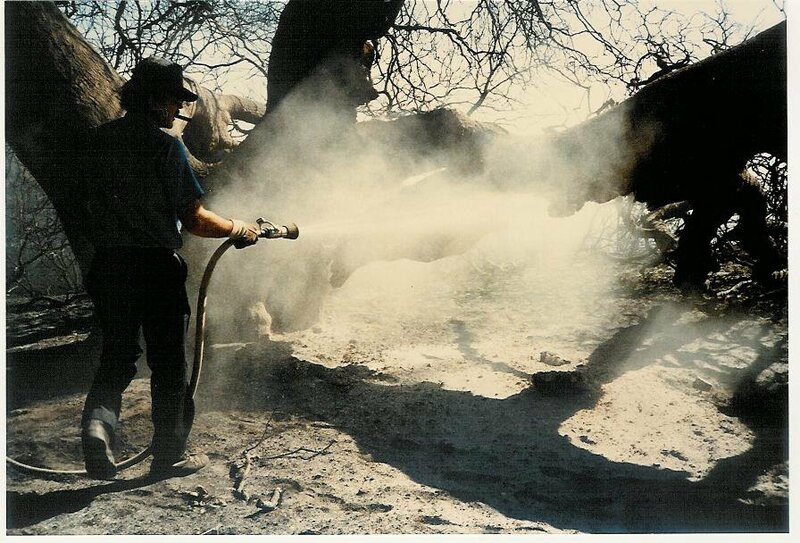 People will not be allowed inside the tree’s drip line while these risks are being fully assessed and addressed. The New Life also applies to the “Baby Baba’s Tree” growing under the canopy of Baba’s Tree. It appears to be healthy, and will be protected and nourished along with its parent. Given its location, this baby tree is almost certainly Baba’s Tree’s offspring, either from an acorn or a limb from Baba’s Tree that has taken root. It appears poised to take its place as the next incarnation of Baba’s Tree in the event of the original’s demise. In the unfolding New Life of Baba’s Tree, one’s experience of it will change, but Meher Baba’s presence will never change.